In 1977, a new kind of Toyota hit US shores. Against the relative bare-bones style of the Corolla, Camry, and Celica, the Toyota Cressida—which was a rebadged Mark II for North American markets—was packed with luxury features that no Toyota before had contained. Even it's name was taken from a William Shakespeare play, Troilus and Cressida, adding to its fancy aura. This mid-sized, high-end sedan had standard features that were considered unusual at the time—features such as air conditioning, a cassette stereo, a rear window defroster, and reclining front seats. But that's not all the Cressida packed. To put together the whole package, Toyota took the best components of their best car—the straight-six engine and rear wheel drive from the Supra—and built the Cressida around them. The result was a powerful yet quiet car that slipped to the front of the Amercian luxury market. 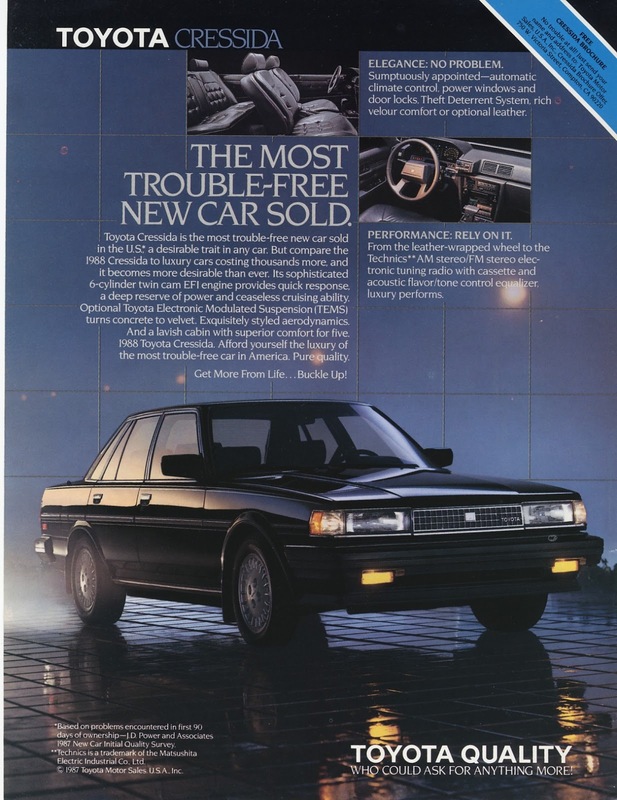 An ad for the 1988 Toyota Cressida at the height of its popularity. Though only imported to the US from 1977 to 1992, the Toyota Cressida was upgraded and redesigned on a strict 4-year schedule. The coming generations saw more features become standard that would normally be reserved for luxury brands like Audi and BMW. For example, sunroofs, leather seats, and automatic temperature control became standard in the fifth generation. Four years later, the Cressida was enlarged and sported more aerodynamic styling for the sixth generation. Though the DeLorean was the de facto car of the future in 1985, it was the Cressida that now included cruise control and a Technics stereo. The Cressida's seventh generation launched in 1989 and would be its last. The engine received an upgrade to a 3.0L 4-valve version with 190hp and was praised as a comfortable and quiet ride. Though the North American Cressida was discontinued in 1992, it proved that there was room for high-end, luxury cars in the segment. Total sales for the Cressida reached over 300,000 units, which is highly impressive considering the Cressida was up against similarly priced Audis and BMWs. "The Lexus LS400 is designed to stir the soul, and not much else." This classic ad was the coming out party for the Lexus brand. While the Toyota Cressida was making waves in the luxury segment, Toyota chairman Eiji Toyoda challenged his company to build the world's best car in 1983. By 1985, Toyota engineers were test driving prototypes all over the world and honing in on the “world's best car.” Code named the F1 Project, the resulting sedan was a rear-wheel drive vehicle that packed luxury features from bumper to bumper. Sound familiar? By this point, Honda had launched Acura, and Nissan had launched Infiniti as their respective luxury outlets. When the F1 project was set to go, Toyota opted to launch a new brand to go with it. In 1989, the Lexus LS400 was launched to rave reviews praising its handling, quietness, and value. While sales were slow at first, by 1991 Lexus outsold Mercedes-Benz and BMW to become the best selling luxury import brand in the United States. The 1989 LS400 (top) took design cues from the 1989 Cressida (bottom). When you look at the 1989 Cressida alongside the first-gen LS400, you'll notice a lot of styling similarities. Though the Cressida would continue to sell well for another few years, the shared concepts and other similarities between it and the LS400 is what eventually led to its demise. While the Cressida was one of Toyota's best-selling flagship vehicles, its sales overlapped with vehicles under the Lexus marquis. And in the end, it didn't make sense for Toyota to compete with itself, especially after rising Lexus sales. A 1993 Lexus GS, which many consider the successor to the Cressida. When the Cressida was discontinued in the United States, its segment was filled by a couple newcomers. First was the Lexus GS, a midsize rear-wheel drive luxury car closely related to the Supra. 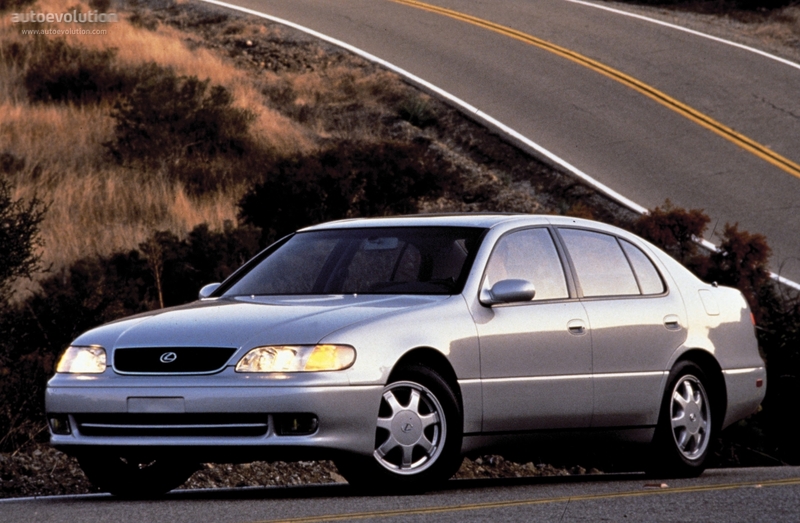 The other was the Toyota Avalon, a front-wheel drive full-size car powered by a V6. Today, the Lexus GS and Lexus LS are still manufactured and exported around the world. Those two cars, along with the rest of the Lexus lineup, have the Toyota Cressida to thank for laying the groundwork for Toyota's luxury segment in North America.